India is a country rich with culture, tradition and history of many powerful dynasties. Their influences can be seen in our way of life, in the relics left behind and in everything that India is today. And since the bygone era, having markets of different sorts is one of the many things that has not changed. Many markets of various eras still continue to exist, almost like how it used to be in the good old days. These places have been selling the best of clothes, accessories and more, especially for traditional occasions. 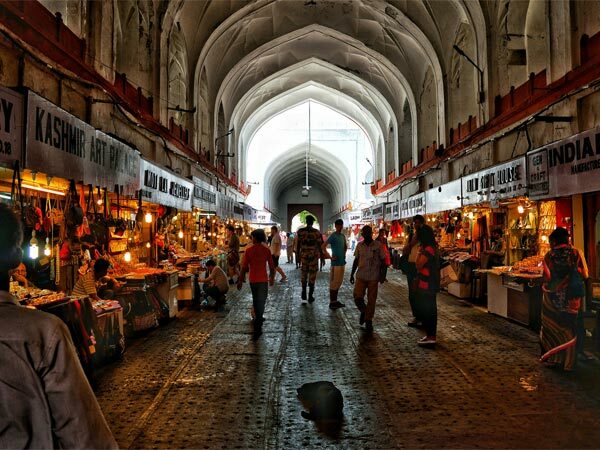 Read about these 7 markets of India that have been functioning from centuries. Meena Bazaar in Delhi is one of the oldest traditional markets, that has been there from the period of the Mughals. It is the most sought after place, especially while shopping for a wedding. The market is located between Jama Masjid Kalan and Dalan. Along with sarees and suits, Meena Bazaar has a wide range of jewellery collections, like neckpieces, earrings, etc. ; definitely a one-stop shopping site for the big day! Formerly known as Black Town, this was established in the 1600s after Fort St George was built. The name was changed to George Town when King George visited India during the 1900s. To find anything at all, right from accessories, clothes, jewellery, to even vegetables, visit George Town; it has it all. You can see the British establishments of the place which have now been turned into Government offices. Temples, like Sri Chennamalleswarar Temple, Sri Sivasubramnya Swamy Temple, etc. are found around George Town, which can also be visited. For all those haggling experts out there, Laad Bazaar is the place to be! Situated right beside the famous Charminar of Hyderabad, Laad Bazaar is an ancient market that sells just about everything; perfumes, sarees, embroidery accessories, to name a few. Pearls of Laad Bazaar are quite famous here and bought by many. Although, initially the shopkeepers might name an expensive price, with a bit of bargaining you'll be surprised for how low you can shop for! You can visit the Charminar after shopping at Laad Bazaar. Head to Johari Bazaar of Jaipur for all the jewellery shopping you need to do. The name Johari Bazaar literally means "jeweller's market". You can find absolutely all kinds of traditional jewellery, like polki jewellery, kundan jewellery and, of course, Meenakari which is Jaipur's style of jewellery made of enamel. The market has not just jewellery but also has stalls of beautiful lehengas, bangles, etc. Beyond the market lies Jaipur's famous Hawa Mahal, which will remind you of the rich heritage of the city. Walk through the streets of Johari Bazaar and experience Jaipur from the eyes of a local. Formerly known as Shor Bazaar during the British period, which means noisy market, due to the hullabaloo of the place, it was later changed to Chor Bazaar which translates to "thief's market", since second hand and stolen goods started flowing into the market. You can find absolutely anything at this market too, right from the small jhumkis you thought you'd never find to an antique piece that you can use to decorate your house. The market remains open all day long. The vibrant Sardar Market of Jodhpur in Rajasthan is an ancient place built by Maharaja Sardar Singh. It consists of everything you'll need for a wedding or a grand event, that could include handicrafts, spices, antiques, clothes, you name it! The sellers are dressed in traditional attire of Rajasthan while selling local products, this will surely attract any buyer to try on something. Don't forget to buy the local style Rajasthani shoes while you're here. One of the most interesting features about Ima Market in Imphal is that it is the world's only market run only by women! Local women discussing socio-political issues over their lunch and looking after shops during the rest of the day can be the most refreshing and an empowering sight in a country run by patriarchy. With almost 4000 business women having their shops at Ima market, you can find the traditional attire of Manipur, spices, local herbs, etc. in this market. This beautiful market of Manipur has been functioning since centuries!